Hydraulic cranes are very simple by design but can perform Herculean tasks that would otherwise seem impossible. In a matter of minutes, these machines are able to raise multi-ton bridge beams on highways, heavy equipment in factories and even lift beachfront houses onto pilings. When watching a hydraulic truck crane in action, it’s hard to believe just how much weight it’s moving because it deals with these multi-ton objects with relative ease. Hydraulic truck cranes vary in lifting power. It’s easy to tell how much a particular hydraulic truck crane can lift just by the name of it: A 40-ton crane can lift 40 tons (80,000 lb or 36,287 kg). 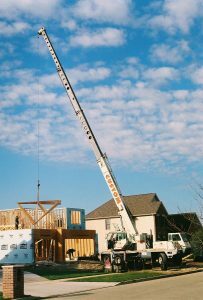 A 30 ton truck-mounted hydraulic crane lifting trusses for houses. equipment to transport a crane to the jobsite. When working on the jobsite, outriggers are extended horizontally from the chassis then down vertically to level and stabilize the crane while stationary and hoisting. Many truck cranes possess limited slow-traveling capability (just a few miles per hour) while suspending a load. Great care must be taken not to swing the load sideways from the direction of travel, as most of the anti-tipping stability then lies in the strength and stiffness of the chassis suspension. Most cranes of this type also have moving counterweights for stabilization beyond that of the outriggers. Loads suspended directly over the rear remain more stable, as most of the weight of the truck crane itself then acts as a counterweight to the load. Factory-calculated charts (or electronic safeguards) are used by the crane operator to determine the maximum safe loads for stationary (outriggered) work as well as (on-rubber) loads and traveling speeds. Truck cranes range in lifting capacity from about 14.5 US tons to about 1300 US tons. A crane mounted on an undercarriage with large rubber tires that is designed for pick-and-carry operations and for off-road and “rough terrain” applications. 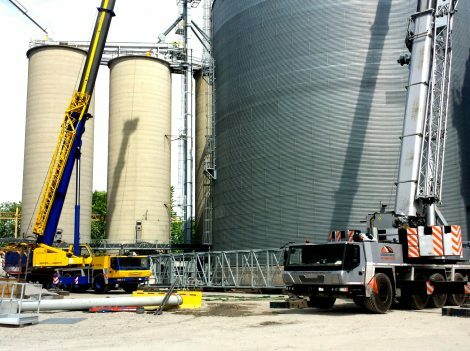 These telescopic cranes are single-engine machines where the same engine is used for powering the undercarriage as is used for powering the crane, similar to a crawler crane. However, in a rough terrain crane, the engine is usually mounted in the undercarriage rather than in the upper, like the crawler crane.